Hello to all my friends and fabulous customers! As you can see, I have been blogging very inconsistently. The reason for this is the chaos in my home and life. We are doing a lot of construction on our home, which is also my workplace. This has made it very difficult to work as well as blog. So, I decided to give myself a little time off, so that I can focus on listing new merchandise and not feel guilty for my lack of consistent blogging. Therefore, I will not be blogging until early to mid-September. Thank you for your understanding. In the meantime, please check out my new shop at SalvageLife.ecrater.com for gently used clothes that cannot be sold on Etsy because they are not vintage, but are still fabulous! 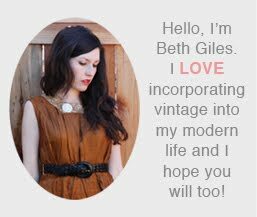 You may also find some great vintage deals there! Love to all of you!